My kids love making Halloween treats and decorations. These easy Cheesy Mummy Dogs require a few quality ingredients from Schwan's and about 20 minutes of time. They were a big hit at lunch with my kids, and they can be customized to use a variety of additional ingredients. As you can see, they are very easy! Slice the dough into long strips. Slice the cheese into strips. 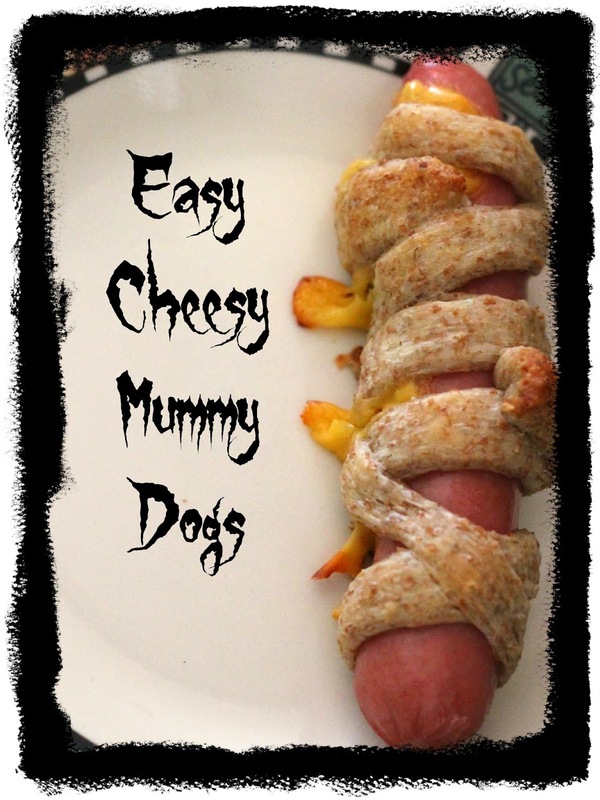 Place one strip of cheese on one hot dog and wrap the dough around it into a "mummy" wrap. Leave room for the "face" of the mummy and feel free to leave some loose or ragged ends of dough for a more "messy" wrap look. Bake according to the directions on the dough packaging. Use ketchup or mustard to create two eyes on each mummy and enjoy! Shwan's has a variety of Halloween-themed recipes, including Orange Ooze and Frog Eye Slush, that your family might find fun to make! If you aren't familiar with their products, the recipes are a great way to sample some new foods and see how they can fit into a busy meal plan routine. What recipe would you make for your kids? *Samples provided. Opinions are 100% my own.